Over the last ten years the Egyptian economy has undergone a major transformation which has led to greater decentralisation and international competition. This transformation, along with changing circumstances in the surrounding Arab areas and the end of hostilities with Israel, has given a boost to the Egyptian economy. Without underestimating the obstacles that still stand in the way of sustained economic growth and development, this book foresees a more optimistic outlook for Egypt than do other such studies carried out by international organisations such as the World Bank. Egypt’s Economic Potential argues that the main problem facing the Egyptian economy is that the government must resort to expensive public expenditure policies, in particular subsidising foodstuffs, in order to maintain the political consensus. This creates a savings gap which prevents the authorities from channelling savings towards financing the projects which will cerate economic growth. 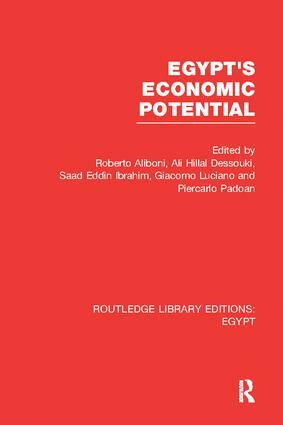 However, the book suggests that because the present regime is fundamentally stable and even further change at the top would be unlikely to alter the institutional framework of the country, the Egyptian economy has the potential for stable and rapid growth.